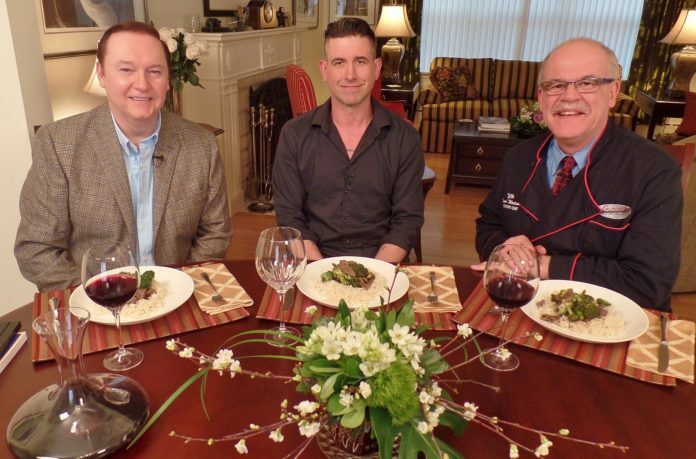 We cooked this dish on One Chef One Critic for former Montreal Canadiens hockey player Terry Ryan. It seemed an appropriate meal for a tough guy who’d spent years playing a very physical sport. Terry is a born storyteller and we were fascinated to hear him speak on a wide range of topics, including food. Stir marinade ingredients together and soak beef in mixture for 10 minutes (or more). Mix the sauce ingredients together in a bowl. Place broccoli in boiling water for two minutes. Drain the vegetable thoroughly. Heat oil in large frying pan. Cook beef making sure it is spread in an even layer and that pieces are not touching. (You may need to cook it in batches to avoid the meat boiling.) Cook beef for one minute. Turn. Add garlic and cook for another minute. Pour in sauce. Bring to a boil. Add broccoli Pour in dissolved cornstarch and stir until sauce is boiling and thick. Serve with rice or noodles.